Animal and Food Processing Waste consists of materials generated in canneries, slaughterhouses, packing plants or similar industries, including animal manure when intended for disposal and not reuse. It also includes dead animals. Due to the physical nature of these wastes and the inherent problems with their handling and disposal, they will only be accepted at the facility if a minimum of twelve (12) hours prior notification is given by the generator or hauler as appropriate. Animal Waste must be double bagged. Animal and Food Processing Waste is a Special Handling Waste and is Waste Type Identification Number 25. Animal and Food Processing Waste shall not be mixed with any other waste when discharged at ACUA's Transfer Station or Landfill. (It is charged as municipal waste/trash). 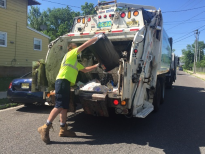 Loads that are determined by ACUA personnel to be comprised of more than 10% (of the total load) waste of a different waste category, then the customer will be charged the higher of the two associated tipping fees. Click here for disposal fees, procedures and hours of operation.